Antioch College and the University of Dayton have teamed up to sponsor a visit by environmental artist Basia Irland this September and again next March. Irland is known internationally as a pioneer in the field of “eco-art”. She conducts community-oriented projects designed to aid in restoring the health of waterways. Irland’s project for the Dayton region began with a summer exhibition of artwork at Antioch’s Herndon Gallery, and continues in September with events at the University of Dayton. Fifty college students are gathered in a large circle at Island Metropark in Dayton. They’ve just kayaked several miles down the Great Miami River, and now they’re creating “river sound poems” with visiting artist Basia Irland. 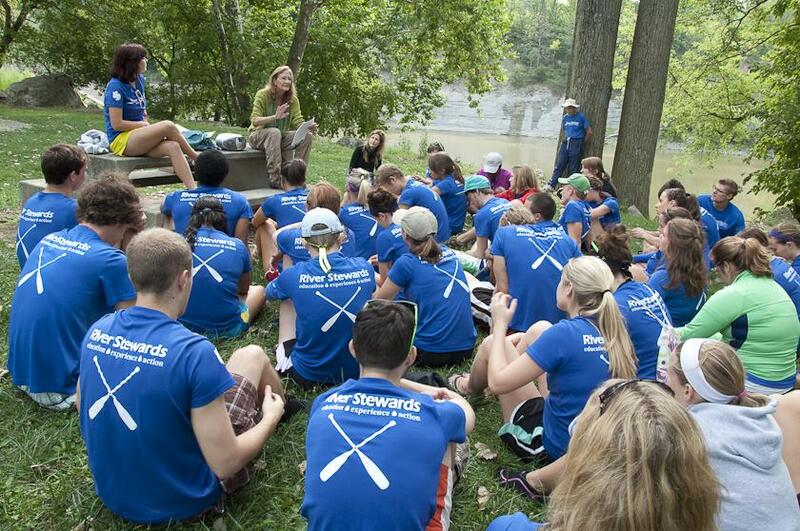 The students are River Stewards from UD’s Rivers Institute. They’ve been eagerly awaiting Irland’s visit for months. So, what can an artist teach us about rivers? “She’s an artist that uses the natural world around her, particularly water, to make art that brings awareness to environmental issues and to community issues, and that fits in alignment with what the Rivers Institute is trying to do with bringing people back to the river to help restore the river’s health and the community’s health,” says Rivers Institute Coordinator Leslie King. Eco art, a practice that combines the arts with ecology, has evolved since the 1970’s in response to increasing environmental degradation. Over the past three decades, Irland has worked on water issues in Africa, Europe, South America, Southeast Asia, Canada, and the US. When the floating icebooks melt, the seeds are released into the river and eventually wash up on the bank. As grown plants they’ll improve the river’s ecosystem. Irland creates these beautiful, poetic objects to address themes of waterborne disease, the health of rivers, and water scarcity. Irland’s visit was made possible through a partnership between the University of Dayton and Antioch College. Basia Irland’s artwork is on display at UD’s ArtStreet through September 16th. Irland will deliver a public lecture on Thursday, September 13th and lead a community parade to launch “ice books” into the Great Miami River on Friday, September 14th. For more information about Basia Irland’s visit and public events, go to www.udayton.edu/arts.